Many of our customers, such as our Sequim Washington client, wanted a secure, strong and dry place to store and work on their motorcycles, snowmobiles, ATVs, boats and jet skis. To have a free-standing workshop storage building is ideal to be able to hammer away and fix equipment safely removed from their residence. 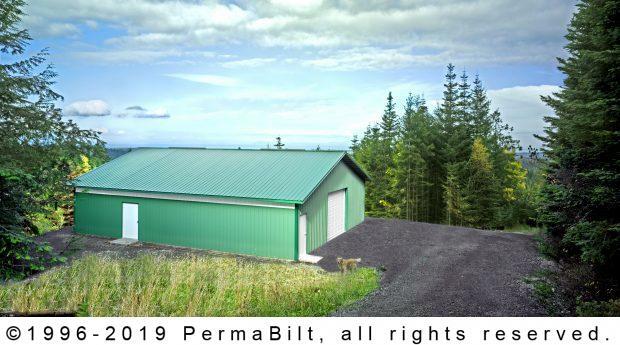 The customer’s building site had some unique permitting requirements including easements, hard-to-locate septic records and drainage requirements that the PermaBilt® permitting staff worked through to obtain the building permit. In working with their PermaBilt® Building Representative on their design, our customer looked to our Rep for his pole building construction experience. For example, one aspect that our customer didn’t consider, but was more than happy to include, was a 2’ poly eave-light running the length of his workshop, providing natural interior light. In the end the customer stated that PermaBilt® was “the most ethical company we have ever dealt with”.